It takes a brave, bold lawmaker to tackle the tough issues. While most politicians are content to pander to their base, taking the middle ground on such non-controversial topics such as abortion or gay rights, some are moved solely by the passions of their convictions to take firm, decisive action. Sometimes a man comes along who is daring enough to say "I will not be silent!" We call that person a hero. On Tuesday afternoon, State Sen. Dwight Bullard (D) filed an amendment to Senate Bill 296 that would change the title of the amendment to "An act relating to the zombie apocalypse." Bullard, who represents the 39th district in South Florida, also filed a separate amendment to modify other language within the bill. The bill, originally filed last fall by State Sen. Jeff Brandes (R), is described as "An act related to carrying a concealed weapon or firearm" during a mandatory evacuation while under a declared state of emergency. But that sounds sooooooo boring. And so vague! The bill would eliminate the hassle of criminal prosecution for anybody carrying concealed firearms under those conditions, essentially bypassing any licensing requirement of the person carrying the concealed firearm. Meaning citizens would finally be free to get their hands on deadly weapons at the best possible time—when they are extremely panicked and terrified of every little thing. Of course, some naive "skeptics" may laugh at Bullard's attempts to protect America's Club Med from zombies (or to try to protest a bill that sort of promotes wildly arming people during emergencies when the populace is already panicked and on edge). But there's one thing I want them to say in the senator's defense—when it comes to Florida, you just never know. 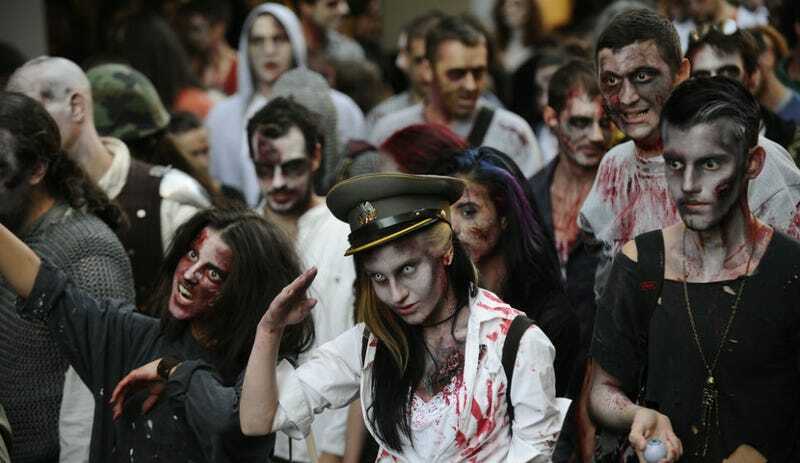 It's probably a good idea to have a backup plan for the zombie apocalypse in that state. Because if there's one place in America where there's a case to be made that people might actually rise from the dead and begin to ruthlessly stalk the living, it's Florida. Also, it's easy to see how the senator might be confused and actually believe Florida is currently under some sort of zombie attack, as many of the state's residents already demonstrate behavior so utterly baffling, it's only natural to assume they are brainless walking shells of their former human selves. The senator's move leaves only question however—just how do the Lizard People fit into all of this? Who will be the next fearless civic leader to step up and take on the difficult task of protecting their citizens from the looming threat of takeover by a secret society of lizards living in disguise as human beings? What about SB LP291, or as pundits refer to it the "Arming of Elderly Residents in Boca Raton with Lasers To Fight Off Giant Lizards" Bill? Has this bill stalled in committee or perhaps been tabled by senators secretly working in league with the Lizard People? Yet another victim of our country's sad dependency on bureaucracy and unholy alliance with an alien race, no doubt.